We hope this article will help give you some ideas and direction on how to make your MINI more powerful. Our expert staff of specialists are available by phone M-F from 7am-5pm at 1-800-946-2642 or by email here. We're happy to help you or answer questions. Upgrading your MINI Cooper's air filter is one of the easiest and most economical ways to give your MINI a horsepower boost. Our bestselling air filter upgrades are made by K&N and are designed to increase horsepower and acceleration. They are washable, reusable and carry a Million Mile Warranty through K&N. Our specialists believe they make The World's Best Air Filters and stand behind that claim 100%. Intake upgrades are all about improving the flow of filtered air into the engine. More air means stronger and more efficient combustion and the result is more power! Upgrades are typically more noticeable in the upper rpm range where the stock restrictive intake causes power to fall off. In our experience, a 2-4 hp gain is typical with filter upgrades, and 4-6 hp gains with intake upgrades. Another side benefit is the increase volume of 'intake sounds'. Exhaust system performance upgrades offer better flow with reduced back pressure for improved performance. These systems typically offer a lower deeper tone with a slight increase in sound volume. Some of these systems install at the front flange, the others are spliced in after the secondary catalytic converter or resonator. We offer top brands from leading performance suppliers Quicksilver, Borla, Remus, NM Engineering and Dinan. Gain exceptional horsepower and torque by upgrading the software of your MINI's ECU. Stock software from the factory is developed with a delicate balance between fuel economy, durability and performance. An ECU software upgrade skews the software towards performance by manipulating parameters such as ignition timing, fuel mixture and boost pressure,just to name a few. Upgrading your plugs and wires increase fuel economy and lower emissions while getting greater ignitability and performance. Performance plug wires are engineered to create an extra powerful spark. This allows energy from the ignition coil to accumulate in the capacitor until the voltage at the spark plug electrodes reaches the ionization point. The stored spark is discharged at once, creating a spark 300 times more powerful than normal. Power modules and performance tuners are the simplest and best alternatives to an ECU Upgrade. One reason being that you don't have to remove your ECU and send it to be upgraded. Tuning devices all have one thing in common, they send a modified signal to the factory ECU, telling it the boost pressure is below target values. They are relatively easy to install with seriously noticeable and impressive gains. Typically less expensive than an ECU Upgrade. 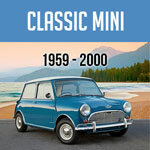 Have you noticed your MINI's engine seems more powerful & responsive in cold weather? As the inlet temperature is reduced, the air packs a greater number of O2 molecules, resulting in more powerful combustion. This nets more power to the wheels. You can have similar performance on warm days with an Intercooler upgrade. The Intercooler is used to cool the intake charge after it has been compressed by the turbo. A 15% reduction in the supercharger pulley diameter of the MINI Cooper S increases the boost of your MINI Cooper S by more than 4 pounds, resulting in a dyno-measured gain of over 20 horsepower AT THE WHEELS. Maximum boost is achieved at lower RPM, giving more power in the mid-range of your MINI Cooper S. At 15%, the supercharger pulley provides the most boost increase available without over-revving the supercharger at high engine RPMs. Stage kits will save you time and effort. 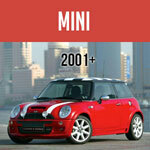 We have taken the guesswork out upgrade options available for your MINI. Each higher stage level will have slightly more components in the kit and will produce an increase in performance. Stage level definitions apply to engine, drivetrain, suspension and brake upgrades. As with any performance improvements, initial gains are relatively cost effective and noticeable.